Everyone loves a food truck, right? You can find items on food trucks that you can't find anywhere else. 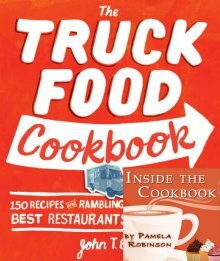 John T Edge has compiled a cookbook filled with food truck recipes from across the country and beyond. I have to wonder why there isn't a restaurant that make these kind of items. Recently a new place opened by me that only sells fair foods. Footlong hot dogs, funnel cakes, and nachos are the norm. So many towns and cities are represented here. Taco Palooza? I love it! Thank you, John T Edge, for putting together such a neat and eclectic cookbook. Times they are a'changing.